So, You want to work with Brad? AWESOME! and resources you need to live your richest life. Here are 4 ways you can get more training & support from Brad Ross. WELL…Today YOU can be one step closer to a NEW YOU! 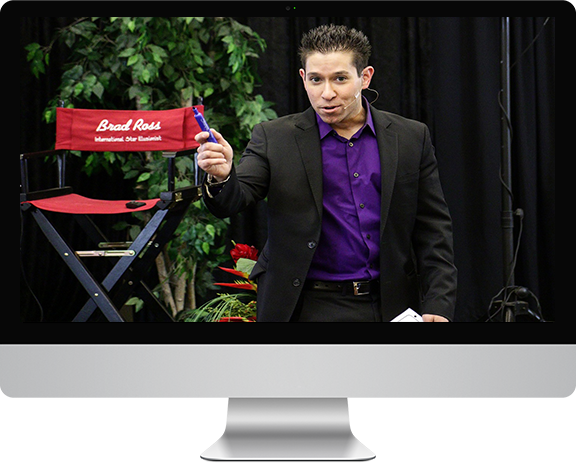 Since 2007 Brad Ross has been privately coaching small business owners and entrepreneurs just like you, LIVE their dreams by doing what they love and in turn, loving what they do! As a Business Coach his goal is to help you uncover your true potential and lead a life that is worth celebrating, while helping you get out of your own way and make radical improvements. Brad’s Magic Marketing Warriors Coaching Program is a one-on-one forum to develop greater results in your business & your life. You will gain insight into your strengths and limitations, then build on that newfound knowledge to advance your business and personal life to the next level of success. Brad provides support, guidance and accountability as a business coach for transforming the issues that stand in the way of you achieving your goals. Whether you want coaching help achieving a specific outcome or wish to enhance all areas of your life, Brad can help you get there faster. It Factor LIVE has been established as world wide leader and the Biggest, Most Amazing, Most Dynamic Multi Day LIVE Direct Marketing & Success “Boot Camp” For Magicians & entertainment professionals. It’s Guaranteed To Be Worth Thousands Of Dollars In Additional Shows And Income To You. Beginning in 2011, Brad set out to create a LIFE CHANGING immersion experience that would be filled with dynamic money-making, eye opening, profit generating marketing training & business building strategies that are quite literally the game changer to EXPLOSIVE BUSINESS GROWTH for entrepreneurs like you. This workshop sells out EVERY YEAR due to the hands on nature of the experience and the limited size. to learn more about what has made this event THE talked-about success & business event of our industry. As one of the most in-demand keynote speakers in the entrepreneurial world, Brad Ross regularly speaks to audiences numbering in the thousands and has spoken & performed in 25 countries around the world, on 5 continents and in 16 languages. His story of magic and marketing, growing his small local business into an international brand makes him one of the most authentic, dynamic and inspirational speakers. You’ll find lots of valuable and free content from Brad on his blog. Since 2004, Brad has put out a weekly newsletter featuring thousands of articles & marketing/ business building golden nuggets. This is the best place to get all of his latest articles, tips and updates sent right to your inbox. Join thousands of smart subscribers who rush to their INBOX to see what new valuable tools & training Brad has in store each week. We recently launched this website and we’ll be adding in archived & new blog content, articles, video trainings & tips every week. Click here to access Brad’s blog.